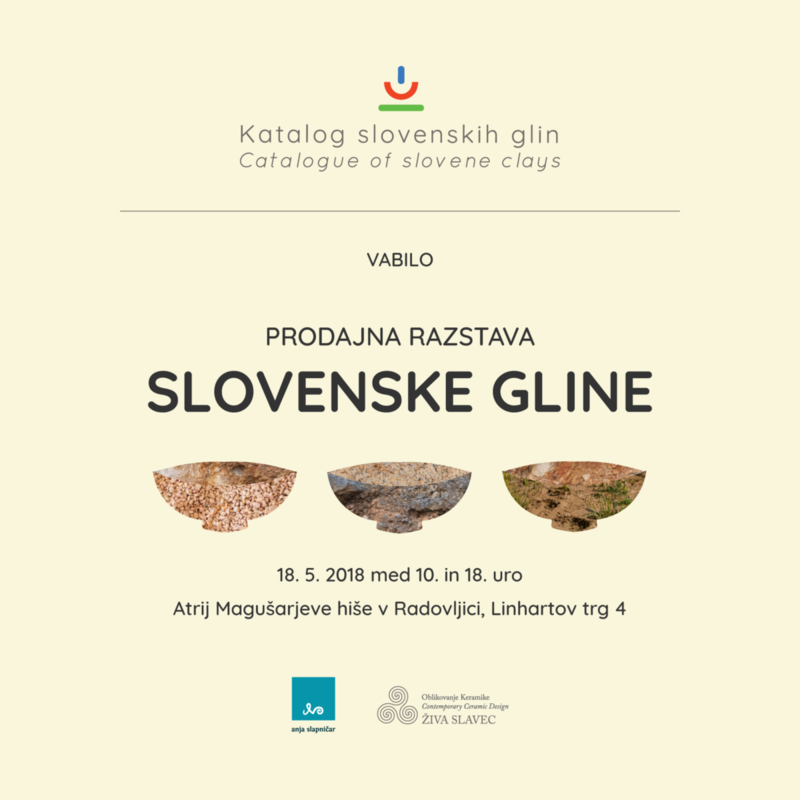 On the same day, exhibition Slovenske gline – Slovene clays will also took place at the same location, where potters from all over Slovenia will present their artworks, which will also be available to purchase. 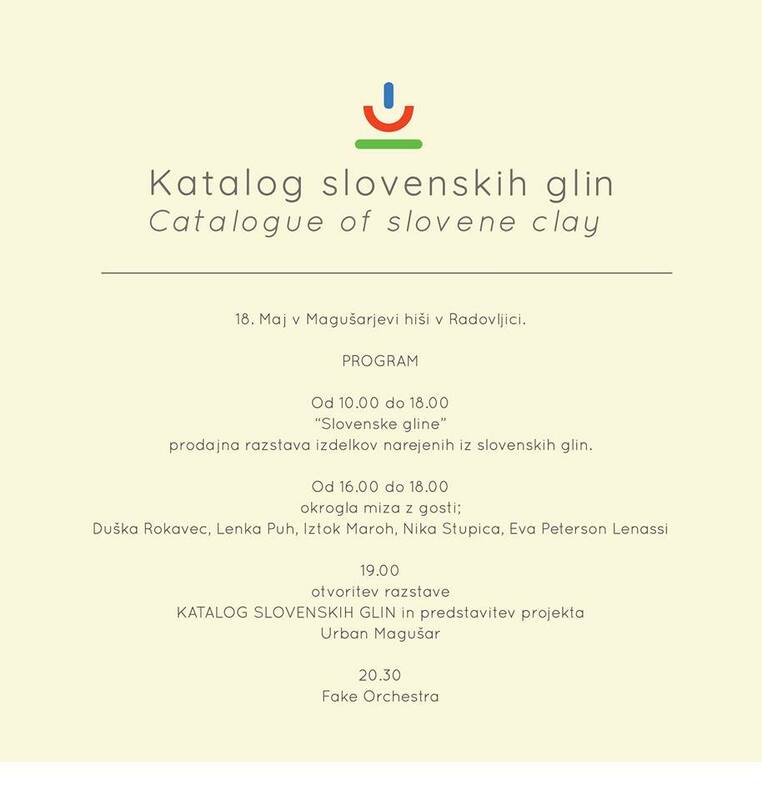 It is a one of a kind event, project, in which many people contributed hours of work, dedication and love towards our own material – our mother Slovenian clay. We, Slovenians often say, that Slovenia is so small; that it’s to small for anything to grow on a larger scale. With this project Mr. Magušar took this disadvantage and changed it for the better. With only 20,273 km², he covered every region, searched for every possible clay pit, and asked potters from the whole country to step together, find clay from their surroundings and join forces in the quest for mapping Slovenia with potter’s most valued material: clay. Dr. Duška Rokavec, a head of mineral department of our Geological Survey of Slovenia and author of book Clays in Slovenia, wrote that about 10% of the Slovenian land consists of clay. This tell us that clay is literally at our feet, and brings out the question: why don’t we use it? In order to answer that question we must first understand the history end economical development of Slovenia. Let’s go back in time. Let’s say 200 years. Before the industrial revolution, before the time, when pots were made by machines. Pots were made by potters, and potters lived, where the clay was. It was simple and logical that what the land provided, man took it and evolution of ceramics and pottery took place. That tells us that people worked with materials which were accessible to them, right at their hands. Old slovenian potters, since the times of man, used our – Slovenian clay. Up until one point. What happened then? Now we rewind time from neolithic period forward up until when the factories started operating in and around Slovenia. Traditional pottery and pots got left behind a little, industrial made ceramics started slowly ousting our low temperature pottery, which was brown and dark orange, weak in strength, and considered as a pot of commoners, used in everyday life, quiet, with no title or prestige associated to it. Those were the times just around when porcelain was well established as royal ceramics. It was white, clean and strong. It was a pot of kings and emperors in the past, and after porcelain started flourishing in Europe, it kept its place in high society and bourgeoisie. It always was and alway will be supreme to brown earthenware. If you couldn’t produce porcelain ware, then you could imitate it. Majolica was imitation of white porcelain in our region. And so handmade earthenware slowly became quiet, and factory made white tableware slowly immigrated into our homes, into our lives. With factory production also large import started happening. Materials from all over Europe no longer had problems being transported from country to country. And let’s not forget the development of glass industries, which are also strong in Slovenia, and plastic industries as well. Oh yes – the incredible plastic. I remember when plastic evaded into our houses. In 1960s plastic also became available in homes of Slovenian housewives. So popular, that my grandmother presented plastic flowers in vases, had plastic table cloth over her linen one, and was secretly ordering plastic bowls from a German magazine Quelle, so that my grandfather didn’t become angry on her spending money. Those were times before Amazon and internet shopping. This is how traditional pottery slowly started diminishing. Foreign material prevailed in many of our homes, and continues to do so even today. Even with the development of studio pottery, clays from other countries gotten better reputation, a better name. Who wouldn’t want to buy fine french porcelain, or a very strong german stoneware? Germany had a status of strength and advanced engineering in our eyes, and so did their clays. And Italian clays had a completely different story, with their beautiful aesthetics covering their good name, as in fashion, architecture, industrial design and as in ceramics. Today I assess about 5% of studio potters use our local clay. Today I assess only 3 to 5 traditional potters still live and produce pottery with our local clays. Today I assess we have forgotten about our clay. It is no wonder that Mr. Magušar is doing what he is doing. He is awakening the sleeping beauty. He is awakening the beast! Our clay is our prised possession. She – yes I change from it to she – she is our jewel. Only our land possesses this kind of clay and this kind of ceramics. We must fight for her, we must wake up, we must preserve her! You all must now come to this exhibition, and see what I am talking about. See what range of colours Slovenia is made of. Anja Slapnicar © 2019. All Rights Reserved.